(1) Dorothy May Pitts, (1909 - 1993), daughter of John Lee and Helen Amanda (Burgess) Pitts. Dorothy attended Scottsville schools and Fassifern School in Henderson, North Carolina. She graduated from Virginia Intermont College in Bristol, Virginia, and married Russell Wood Jordan, Jr., a Richmond lawyer, on 17 October 1934 in Scottsville. (2) Kathleen Colley, daughter of Frank Britt and Laura (Burgess) Colley. (3) Innes Harris, (1905-2003), daughter of Dr. Percy Harris, Sr., of Scottsville. Innes married John Atkins Moulton; she was the sister of Percy Harris, Jr.
(4) Florence Barclay Pitts, (1911 - 1943), daughter of Marion Arthur and Julia Elizabeth (Holladay) Pitts. In the photo, she is the little girl standing in front of the group and beside Percy Harris seated on the 4-wheeled toy. Florence grew up to become a nurse and later married Harold Robertson, a chiropractor. Florence worked for some time at Blue Ridge Sanitarium in Charlottesville where it is believed she contacted an eventually fatal case of tuberculosis. Florence died in Morristown, New Jersey. (5) Edward Dorrier, (1906 - ), son of Walter S. and Cornelia (Burgess) Dorrier of Scottsville. Edward married Hazel Clevinger, a teacher at Scottsville High School, and they were the parents of one daughter, Irene Dorrier. (6) Katherine Elizabeth Pitts, (1907 - 1992), daughter of John Lee and Helen Amanda (Burgess) Pitts. Katherine was born at Belle Haven in Scottsville and graduated from Scottsville schools. She graduated from Randolph Macon College in Lynchburg, Virginia, and married John Randolph Phillips, a writer, on 6 April 1929 in New York City, New York. (7) Percy Harris, Jr., son of Dr. Percy Harris of Scottsville; he is the brother of Innes Harris. 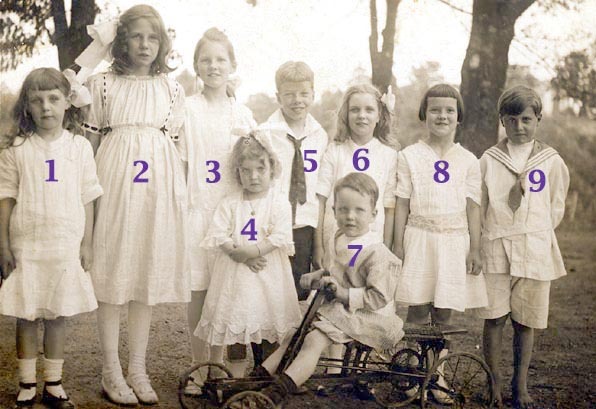 In this photo, Percy, Jr., is seated on the 4-wheeled toy. (8) Stella Crisp Pitts, (1907-1988), daughter of David Henry and Stella (Crisp) Pitts. Stella graduated from Harrisonburg State Teachers College, Harrisonburg, Virginia, and married Burchard Simpson Pruett, a St. Louis doctor, on 12 August 1932 in Scottsville. Stella was a teacher in Buena Vista, Virginia, and later a dietician at the University of Virginia Hospital in Charlottesville, Virginia. (9) William Harold Burgess, (1909 - ), son of William Edward and Ellen Gentry (Cornett) Burgess. William attended Scottsville schools and married Blair Christian Clark. This photograph is part of the Kathleen (Phillips) McNamara collection. Kathleen resides in Scottsville and is the granddaughter of Captain John Lee Pitts and Helen Amanda (Burgess) Pitts; Kathleen is the daughter of Katherine Elizabeth Pitts.